As someone who has managed to stay consistently afraid of the dark since my childhood, I’m often really grabbed by the idea of darkness being the enemy or some sort of force. When the darkness is more than an absence of light, it lets people who’re afraid of the dark literally face and fight their own fears, and I think that’s an important step that horror games should be taking. Yes, they’re designed to scare us, but what if they were designed to help us be braver by facing our fears? Well, Bulb Boy flirts with that concept a bit, and aside from a painfully idiotic blurb from Pewdiepie, this Kickstarter project shines as bright as the Bulb Boy himself. 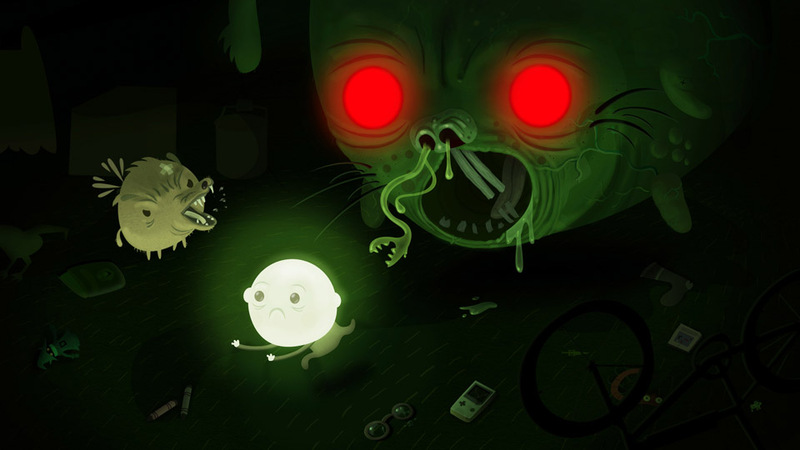 Bulb Boy, from the ambitiously named Bulb Boy Team, is a point-and-click survival horror adventure where your only light in the darkness, and the only defense you have, is your tasty noggin. You have to best the evil that has overcome your dark house, relive your memories in search of your past, and combat the darkness with your shiny head. All this is backed up by an adorable minimalist design that is surprisingly immersive in all gameplay I’ve seen. It’s an eerie mix of cute and creepy, and I think it’s the project to watch right now. If you’d like to learn a bit more about Bulb Boy on Kickstarter, you can click any of the blue words in this article. By clicking those links, you’ll also travel to Bulb Boy’s Portal-o-Money where you can throw cash at reward tiers to help support the game! You can also download a demo on PC, Mac, or Linux, and get excited for the release on all three of those platforms. Next articleAre You There God? It’s Me, Deer.